How To Get Started with Gmail “Confidential” Email? A colleague sent me an email message through Gmail that had an expiration date on it. So cool! How can I do that too? Generally speaking, email is pretty confidential already and it’s easy on Mac or Windows to encrypt a file before you send it along, whether it’s a photo, Word document or even a folder full of spreadsheets from the lab. But there are a lot of steps, and having email that can’t be forwarded or printed and self-destructs in a specified amount of time, well, that’s like something out of Mission: Impossible, right? Very cool. Now the bad news: Turns out that it’s really almost impossible to completely protect communication, even if it’s encrypted with top military grade encryption. One simple reason is that if I can see it on my screen, I can capture it or even take a photo of my computer – or mobile device – screen to subsequently share it with others. Still, much of security is making things more difficult to overcome than people’s willingness to circumvent security (like having a lock on your front door while there’s a big window two steps away), and in that sense Gmail‘s new “Confidential” mail feature is pretty interesting. 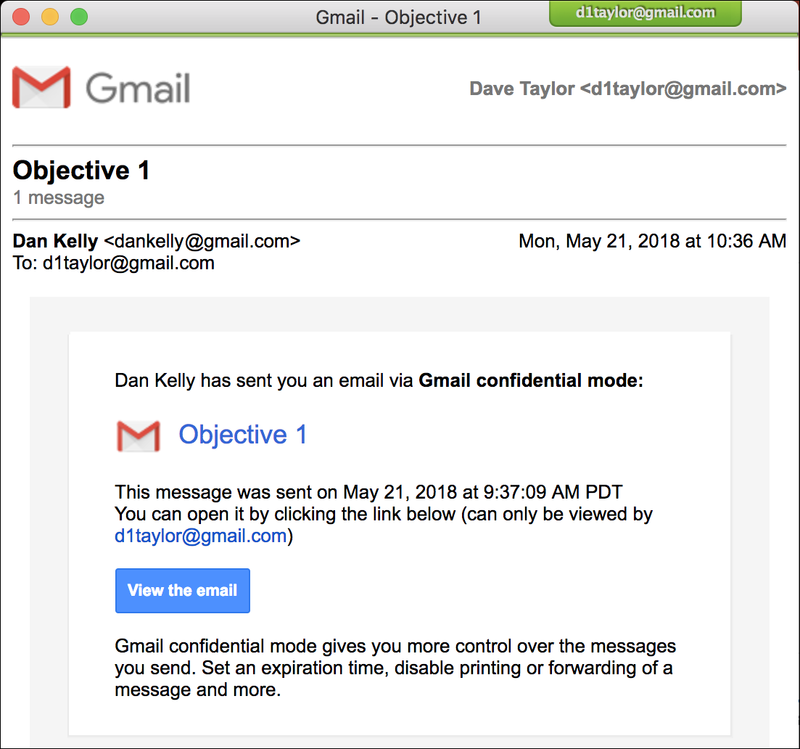 The two basic features of Confidential mode in Gmail are setting an expiration date for the message and requiring a passcode (set by Google and generally using SMS text messaging to ensure the recipient is who you think they are). Easy to work with in both cases. Notice that the expiration – May 28, 2018 – is simple and overt. But what else can you do with the message? Obviously you can take a screenshot as the image above demonstrates! As you’d hope, he can’t see the original message to which I’m replying but this message has retained its expiration date, as shown on the top right (not on the bottom of the message body, however, which is a bit random).